When we started writing The Little SAS Book in 1992, the typical SAS programmer had a shelf full of SAS manuals that could be measured in linear feet. Sometimes they had several such shelves. The SAS Language: Reference manual by itself was nearly two inches thick and weighed four pounds! This was the environment in which we conceived the idea of a small book that would be easy to use and would cover the most popular and important features of the SAS programming language. We named this book The Little SAS Book as a joke since, at the time, the term "little SAS book" was an oxymoron. Our vision for The Little SAS Book was based on our experience helping people write and debug SAS programs. The book needed to be small and non-threatening, explain the fundamental concepts, cover each topic in just two facing pages, contain programs that are complete and executable, include explanatory graphics, and avoid jargon as much as possible. Over the years, SAS software has evolved a lot, and The Little SAS Book has evolved with it. Now the family has grown. The newest book, Exercises and Projects for The Little SAS Book Fifth Edition, is a companion to The Little SAS Book. 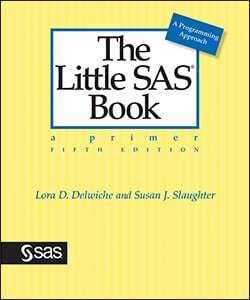 This book contains multiple choice, short answer, and programming exercises designed to test readers’ knowledge of material learned from the corresponding chapters in The Little SAS Book. The final chapter contains comprehensive projects that challenge readers to synthesize material from the entire book. Solutions are included for odd-numbered multiple choice and short answer questions, along with hints for all the programming exercises. The third member of the family is The Little SAS Enterprise Guide Book. SAS Enterprise Guide is a point-and-click interface to the SAS System which is another way of saying that it writes SAS code for you. This book does not replace the original book. If you want to write SAS programs, then The Little SAS Book is the book for you. If you want to point-and-click your way to reports, and analyses then The Little SAS Enterprise Guide Book can help you. If you write programs in Enterprise Guide, then you can use both books together. Once in a while someone stops us at a conference, or sends us an e-mail message thanking us for The Little SAS Book. Some people have even told us that The Little SAS Book made it possible for them get their first job. That's the best part of writing books--knowing that we have helped people reach their goals. "The new edition of The Little SAS Book does an excellent job of introducing SAS users to the basics of accessing data, analysis, and reporting. It addresses these concepts in an easy-to-understand but comprehensive manner. It also includes the latest and greatest of pertinent new additions to SAS software. But most importantly, it weaves best practices and standards throughout all of its content." --Jennifer First, Vice President, Systems Seminar Consultants, Inc.
To find more information about this book including the table of contents, a sample chapter, and code and data from examples, click here. To read a review of The Little SAS Book: A Primer click here. This unsolicited review appears on page 7 of the Winter 2010 issue of The Missing Semicolon published by Systems Seminar Consultants, Inc., a SAS training and consulting company based in Madison, WI. "Since the first edition was printed in 1996, The Little SAS Book (now in its fifth edition) has been a guiding light for new and experienced SAS programmers alike. Now, there is a companion guide that empowers Little SAS Book readers to test their programming knowledge and apply their programming skills through a compelling array of SAS questions, exercises, and projects." --Herbert M. Turner, III, President and Principal Scientist, ANALYTICA, Inc.
To find more information about this book including the table of contents, an excerpt, and data from examples, click here. To find more information about this book including the table of contents, a sample chapter, and and data from examples, click here. Together, we have made over 90 presentations at local, regional, and international SAS user group meetings. We've collected our favorite papers, and you can download them from avocetsolutions.com. This page was last modified on 31 March 2017, at 09:35.